Choose from a variety of sizes and 7 of the most popular Sunbrella® colors. All are covered by Sunbrella's® 10 year warranty. Each tarp is manufactured in our canvas shop with sturdy double folded hems. We use strong UV resistant V-138 thread. Heavy spur grommets are placed in each corner and spaced evenly along each side approximately 18" apart. 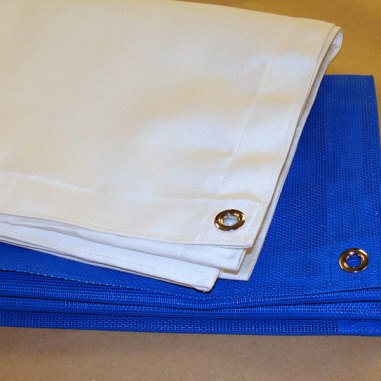 If you don't see your size or color here, call us for a quote for your custom Sunbrella® tarp. All are made the in USA! I had been looking unsuccessfully to find a Sunbrella cover for our utility trailer, which is stored outside in the Arizona sun. We thought that the Sunbrella tarps made by Sailmaker's Supply might work instead, and it has proven to be a great alternative to having a custom cover fabricated. The grommets installed at 18" intervals provides all the needed tie-down points to adequately secure the cover. Very well made product; quality and workmanship is first rate. Very, very pleased with our purchase. Quality customer service. Quality product. Quality Fabric. If you love what you own, then protect it with a Sunbrella tarp as if it's beauty depends on it! Superb quality - and fast delivery. Both me and my boat are very happy.